PEBBLE GARDEN in the evening. geraniums, thyme, dianthus, sempervivum and sedum. More back garden pictures on my latest blog. This area is usually very dry and sunny ... the pebbles have had a good wash with rain lately ! Conker and Truffle are so sooooo sleek and beautiful!!! So are the plants behind them!!!!! Hi Tommy .. thanks !! ... they're hoping to enjoy some sunbathing soon ! Another photo that just makes me smile! Thanks, Sheila, Carole, Pixi and Wildrose ..
Glad you like the garden.... will be even better when the weather warms up ! I,m just pleased that the violas are still looking good in the tubs! Garden looks colourful Terra and lovely to see Conker and Truffles looking good too. Thanks Lawley and Linda ..
Gorgeous Dogs Terra, what an Album you must have of these beautiful animals..
"Kings of all they survey" .. Yes, Shahida ... You're right ! My dogs get more chances to relax than I do ! I'm very pleased with my Pebble Garden. ...'this area includes aubretia, erysimum, iberis...Oh! and two beautiful boys'!!! This is a really nice photo. Two smart lads showing off their handywork. What is the orangy flower on the rt hand side? 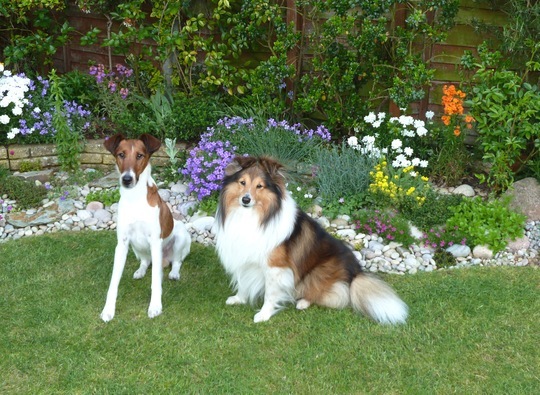 The orangey one is an Erysimum..
Hi Terra, that is such a lovely photo of Conker and Truffle.....did they say CHEEEESE?